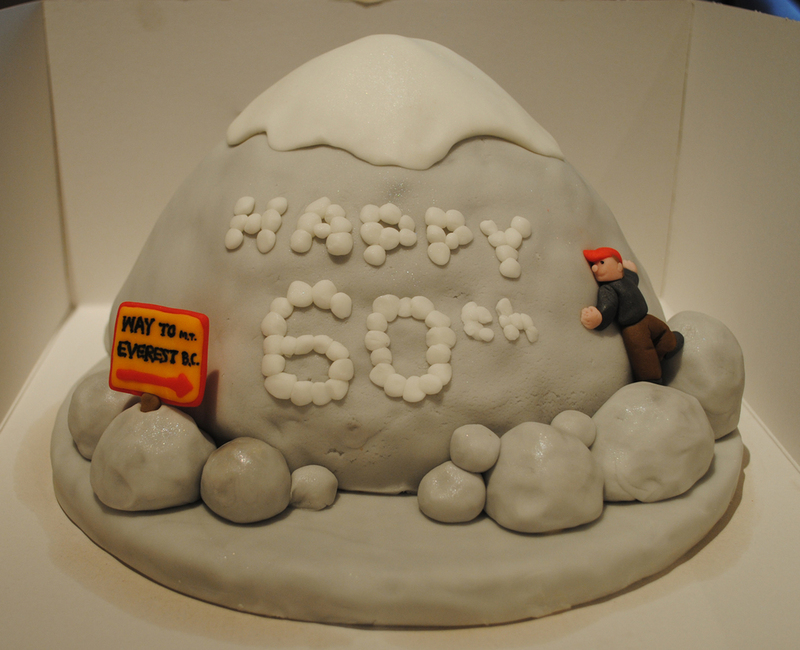 This weekend I made a cake for my Uncle's 60th birthday and, as he recently went to Everest Base Camp, my cousin asked if I could make it Everest themed. The wonderful thing about making a cake that looks like a mountain is that you don't really want the finish on the icing to be too smooth, so no icing smoother was required for this one. Instead I just put one layer of grey fondant over the entire thing and then brushed it over lightly with some silver edible lustre dust, adding a few extra bumps to the surface as I went along. Then it was just time to add a few finishing touches! I made a few rough boulders (using the edible lustre again for a slight shimmer), the iconic base camp sign, and a little fondant man to climb the side of the cake (wearing the same colours that my Uncle wore on his trip). I'm sad to report that the cake didn't actually make the trip down to my Uncle's in one piece entirely - the poor little man broke every fondant bone in his body after a slightly sharp brake in the car. However, I patched it up as best I could once we arrived, and I think I just about got away with it! Thank goodness he had a wall to rest against after!